Tipped off by FoodEater’s post about Doomie’s Home Cookin, the BF and I braved LA traffic this afternoon to drive to Chinatown for lunch. Doomie’s Home Cookin’ is located upstairs in a bar called Roberto’s Club. You can either eat outside on the patio, or inside in the bar. I took the BF out for a surprise birthday dinner last night to a nearby restaurant called Upstairs 2. It’s actually part of the Wine House which is downstairs. 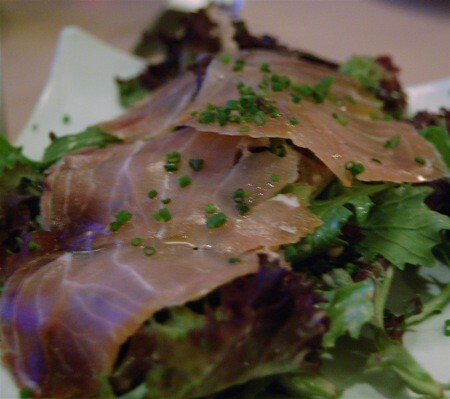 The place features tapas-sized plates of food as (obviously) a variety of wines. They were offering a prix fixe menu that night and the items on the menu sounded good to me, so I chose that. My appetizer was smoked blue marlin on top of some salad greens dressed with a pink peppercorn dressing. The smoked fish was good but didn’t taste any different than smoked salmon. The dressing was too salty, which overpowered the peppercorn taste to the point where I wouldn’t have known it was there if it were not on the menu. The salad dressing almost tasted like fish sauce, but I couldn’t tell if it was because of the fish on top or the excess salt. I would have preferred the dressing to be a bit more acidic to balance out the saltiness. 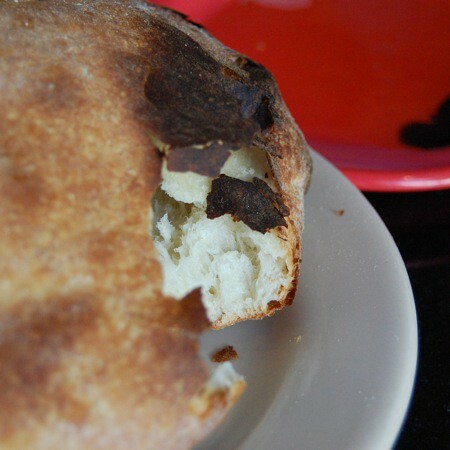 The BF was craving warm, fresh baked bread and Italian food, so we went to Angeli Caffe on Melrose. It’s a small Italian restaurant with pretty good fresh bread and pasta. For such good food, it’s strange that it’s so under-appreciated, but that’s good for us because that means we don’t have to wait to get a table. We started off with a beet salad with burrata, which I had on the side so the BF could share it with me. 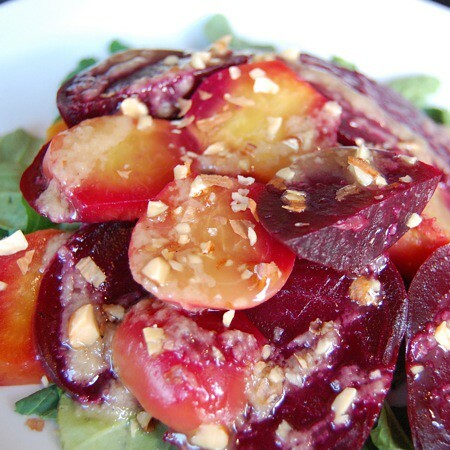 The beets were sweet and went surprisingly well with the arugula that also came in the salad. The burrata’s creaminess balanced the sweet and tart dressing out well too. 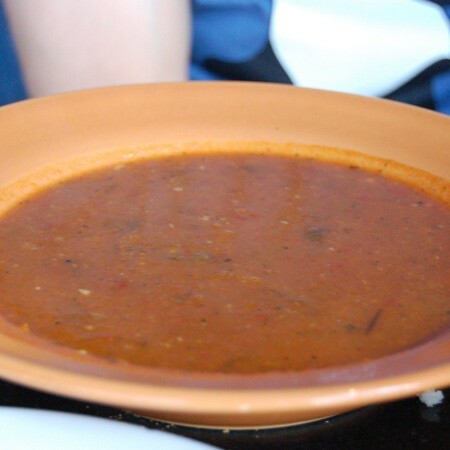 We also had the minestrone soup which was more like pureed minestrone soup. 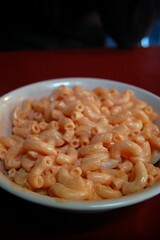 It was delicious and had a nice spiciness to it. I could have had a big bowl of it and some of the fresh bread and have been happy. 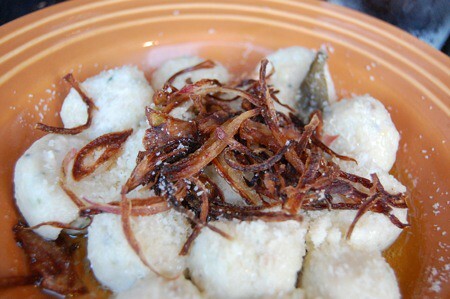 As a main dish, I had the gnocci of the day, which was in a butter sage sauce and topped with crispy fried shallots. The gnocci was the perfect chewy consistency without being too starchy or too soft. The butter sauce and shallots made the gnocci richer than it already was, but it was washed down perfectly with the wine we also ordered. 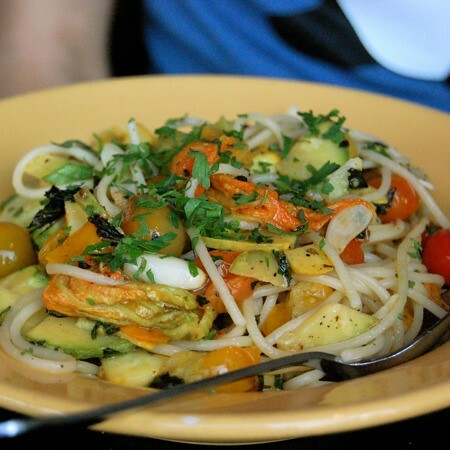 The BF had their spaghetti with grape/cherry tomatoes, mint, zucchini, and zucchini flowers. The flowers tasted great and the spaghetti was nice and al dente, but the mint in the dish made it taste weird. I think if they used a little less mint, the dish would have been better.